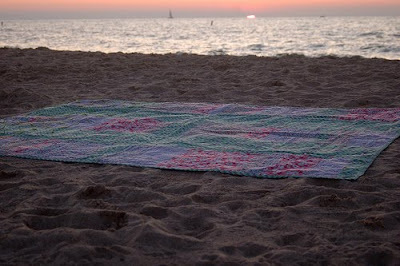 I have been searching for a perfect picnic blanket for years. I've looked in stores and online, and I've never found one that was just right (at the right price). I wanted something pretty, lightweight, and easy to carry that I could bring to the beach or playground or just put down in the backyard for an afternoon snack. 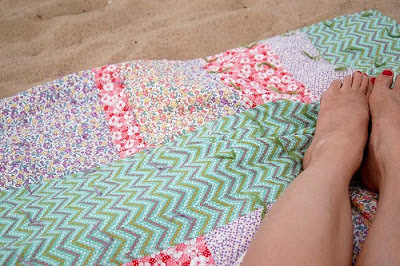 It didn't occur to me to make my own blanket until I was drooling over the book Last Minute Patchwork + Quilted Gifts. Luisa kindly sent me the book a few months ago, and as soon as I saw the picnic blanket featured in the book, I knew I wanted to make it. It was a great combination of something that I really needed -- the perfect afternoon playground blanket -- with a project that would challenge me but that I also knew I could finish. It was my first chance to make a pretty large quilt (twin size), but the instructions called for tying instead of quilting (I'm still intimidated by the idea of trying to maneuver a huge quilt sandwich through my machine) so it was perfect. I love how it came out, and we've been using it nearly every day since I finished it last month, from our own backyard to the beach. I even brought it with me to the apple orchard this morning.